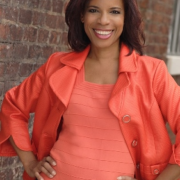 Author, Actress, Speaker Robyn Hatcher on "Standing Ovation Presentations". Robyn Hatcher is an author and communication skills expert who brings more than 17 years of experience to her position as Founder and Principal of SpeakEtc., a boutique communication and presentation-skills training company. As Robyn knows that many communication issues stem from people’s inability to recognize and “own” their tremendous value, she delivers dynamic presentations, workshops and training’s that are both engaging and inspirational. Once an extremely shy child, Robyn is passionate about teaching individuals how to transform their process of communication so that they can express themselves effectively and powerfully. With that in mind, Robyn recently launched her first book,Standing Ovation Presentations(Motivational Press, 2013), a complete presentations skills guide that contains a unique communication-style system called ActorTypes. Robyn knows from years of training others that most people have a core set of strengths that relate to one or more of nine different character types found in movies and TV. Using these personas, she provides readers with detailed tips and skills on how to polish strengths and minimize weaknesses so they can create and deliver stellar presentations and communicate with style – their own style. Over the course of her career, Robyn has helped thousands of business professionals improve their presentations and conduct successful interviews and interpersonal communication. Her clients have included C-suite executives and entrepreneurs, as well as academics and human services professionals, among many others. Her corporate client roster has included Fortune 500 companies and noteworthy brands, including Lifetime Television, Jones New York, AXA, Jet Blue, Deloitte & Touche and Merrill Lynch,to name a few. Prior to founding her own consultancy, Robyn worked as a professional actress, appearing on stage in New York and surrounding region, as well as in television commercials and dramas. She has also provided voiceover talent for radio advertisements. Robyn served as a writer for two daytime dramas and is a contributor to American Express Open Forum. In addition, Robyn has frequently appeared as an expert guest on HuffPost Live, was a contributing media expert in PRNEWS 2013 Media Relations Guidebook, and wrote a personal essay that became a part of the published anthology Dancing at the Shame Prom (Seal Press, 2012) (which was recently featured at www.mariashriver.com). Robyn is a current member of the prestigious New York Women in Communications, Inc.(NYWICI), Savor the Success, Step Up Women’s Network, Writers Guild of America East,Screen Actors Guild, Actors Equity and American Federation of Radio and Television Artists,and was an appointed member and committee chair of Manhattan’s Community Board Five for six years. She holds a Bachelor of Fine Arts from Adelphi University. One of Robyn’s proudest achievements is raising an incredible son who went from attending the New York City public schools to graduating from Yale University, then was drafted into a Major League Baseball organization where he is currently a minor league pitcher. She lives in New York City with her husband of 29 years, Ken Becker. Robyn uses her extensive experience to create innovative material and bring out the dynamism in every person she coaches. Her warm, humanistic approach and passion for her work encourages learners to push through their fears and into their greatness. https://www.globalbusinessnews.net/wp-content/uploads/2014/07/Robyn-Hatcher-2.png 372 281 Ed https://www.globalbusinessnews.net/wp-content/uploads/2019/04/New-GBH-4-24-2019-1202x167.jpg Ed2014-07-03 17:11:592016-12-06 19:10:21Author, Actress, Speaker Robyn Hatcher on "Standing Ovation Presentations".